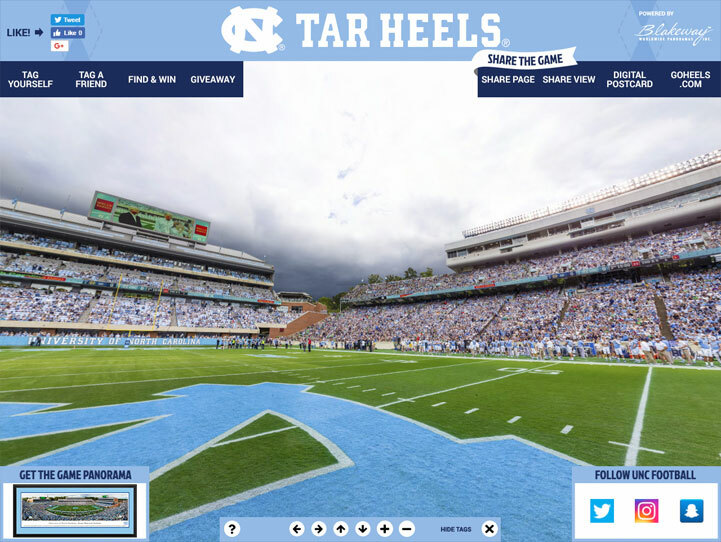 This panorama captures the North Carolina Tar Heels™ hosting the University of Notre Dame® at Kenan Memorial Stadium. Located in the heart of the Chapel Hill campus, the stadium is known for its majestic setting and captivating atmosphere for Carolina™ Football. Many prominent expansions have taken place since the Tar Heels® home opened in 1927; the historic venue began with seating for 24,000 and has grown to a capacity of 63,000. The Kenan Football Center, behind the west end zone, houses the Hall of Honor and a variety of state-of-the-art facilities for the Carolina football program. The Blue Zone, located at the east end of the stadium, features suites and club seating for Tar Heel fans.